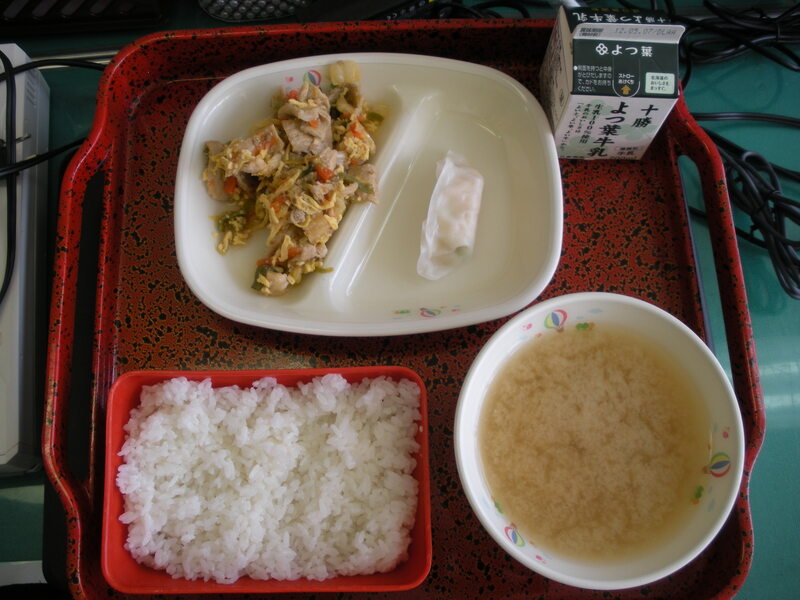 Egg Usukuzu Soup is a soup that has a thin viscosity. 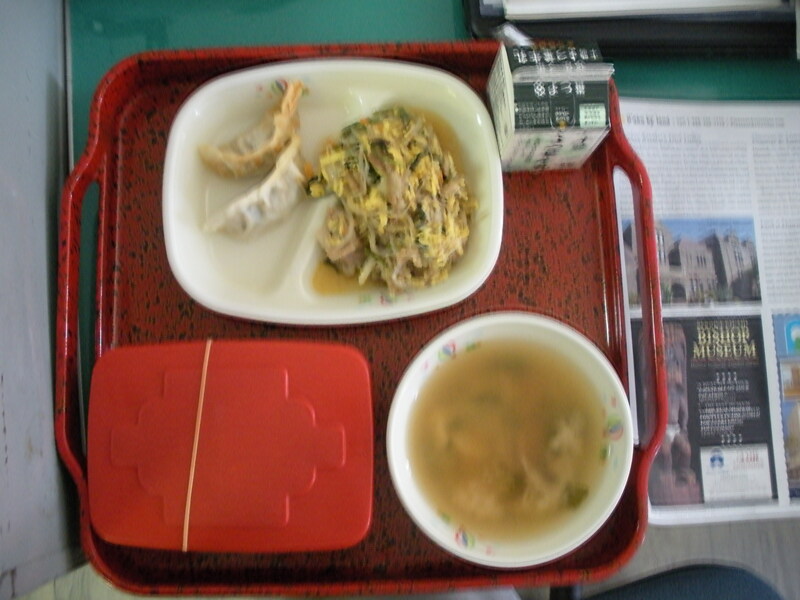 There is also a simmered dish with the same name (usukuzu). 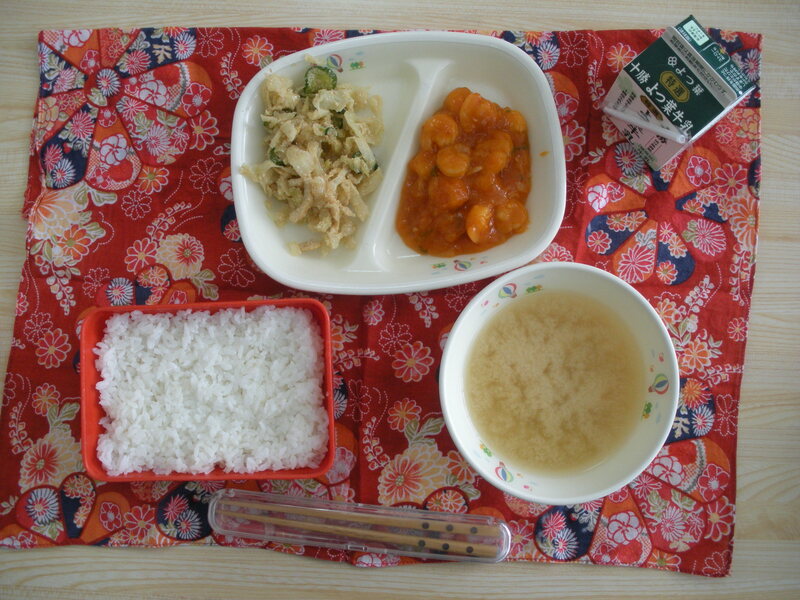 Lately, it seem like we have been having Chinese-style lunches on Friday. Dishes like dumplings are generally served on Thursday (with Chinese noodles of course), so I was surprised to see it on today’s menu. Qingjiao rousi is a dish characterized by green peppers and meat. As awesome as crystalline wrapped shrimp sound, my favourite today was of course the soup. Mostly, because I really love soup. And I also really love imitation crab. Yum! Yum! 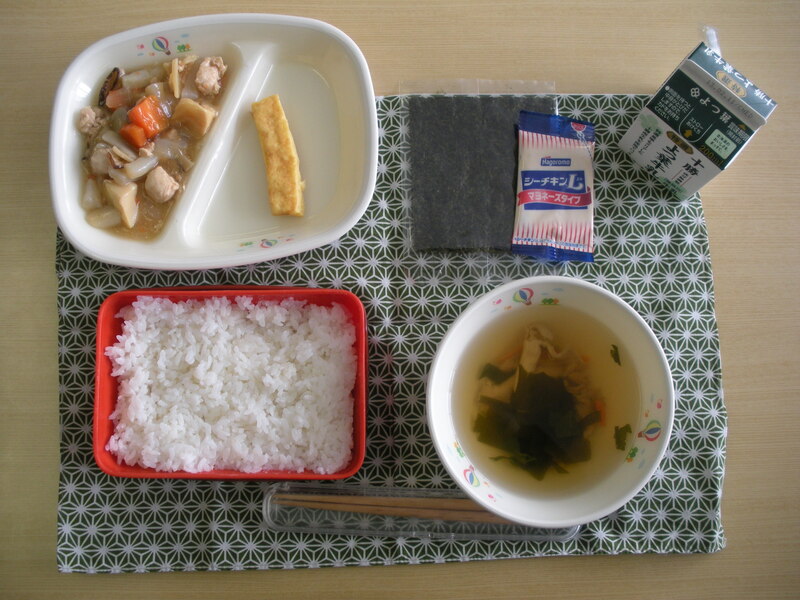 “Ususkuzu” is literally “thin-starch”, so it means a soup whose broth is thickened slightly with kudzu starch. I was asking my friend about precisely what it was, and she mentioned that while they never ate usukuzu soup in her hometown in Okayama, she thinks of Kyoto when hearing the term. So it might be a somewhat locallized dish. Tofu is made by condensing the deliciousness and nutrition of soybeans. Furthermore, it makes the nutrients of the soybeans easier to digest. Today was one of my favourite lunches, I think. First of all, miso oden is so delicious! Too delicious for words. It has all my favourite foods in it: konnyaku, kamaboko, eggs, carrots! And they are all imbued with a delicious grainy texture of pale miso. I really like it. I should learn how to make it home. Rockfish has a light flaky taste, with the slight sharpness of salt culture (shio koji). 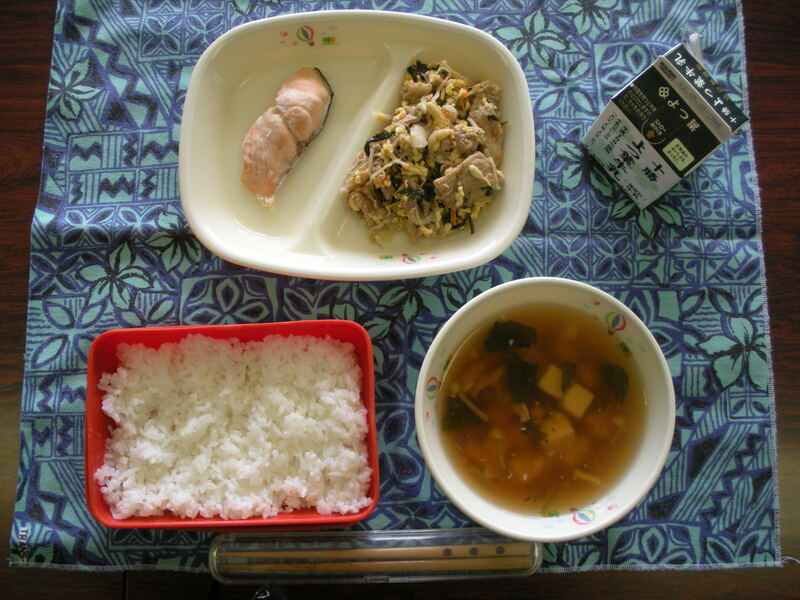 Lacking bones and separating itself easily, it is easy to eat with chopsticks. Ankake soup is a starched thickened shoyu(?) based soup full of delicious tofu and mushrooms. Really, the only difficult thing about today’s lunch was I felt so full after eating it all. Yum! Yum! Yet despite that, it is surprisingly low in calories. 773 food calories might seem like a lot, but please recall that at least half of that is from the rice. Seasonal food is much more delicious. Looking around you, can you feel the plenty of Autumn? Autumn may be the most delicious season of them all. Rice: Always Yummy and Sweet! A strong awareness of the seasons is part of the Japanese national character. The modern incarnation of this includes associating certain activities with the seasons. In the case of Autumn, it is usually associated with eating, sports, and reading. Eating is hardly surprising, given it’s harvest time. Sports can also be logically explained as the cool but not yet cold weather of Autumn is most suitable for physical activity. Reading doesn’t have a particular reason to my knowledge, but if you have passed your Sunday in the park reading while gold and crimson fall gently about you, I think you should be able to understand. Bibimbap Rice Bowl uses soybean sprouts. Some types of beansprouts include black mappe sprouts, soybean sprouts, and mung bean sprouts. 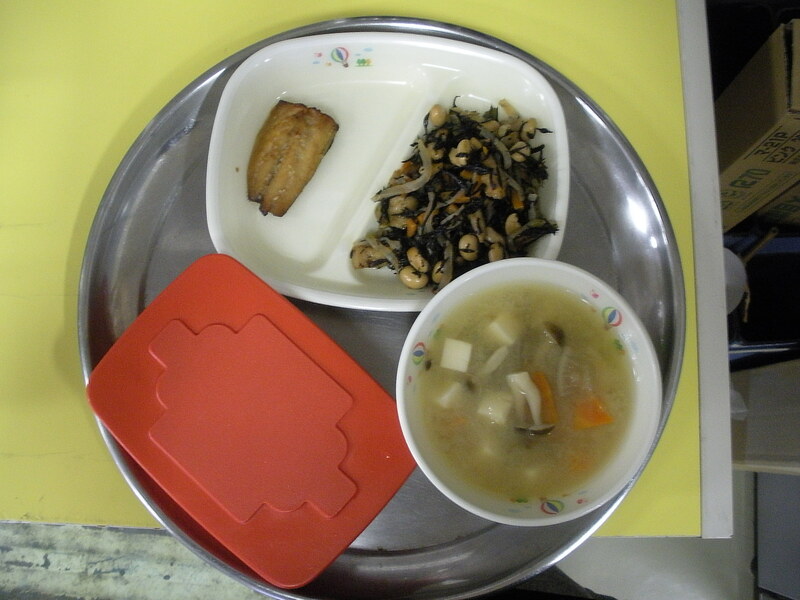 The second trimester of school has started again and I got to eat school lunch again after a long while. 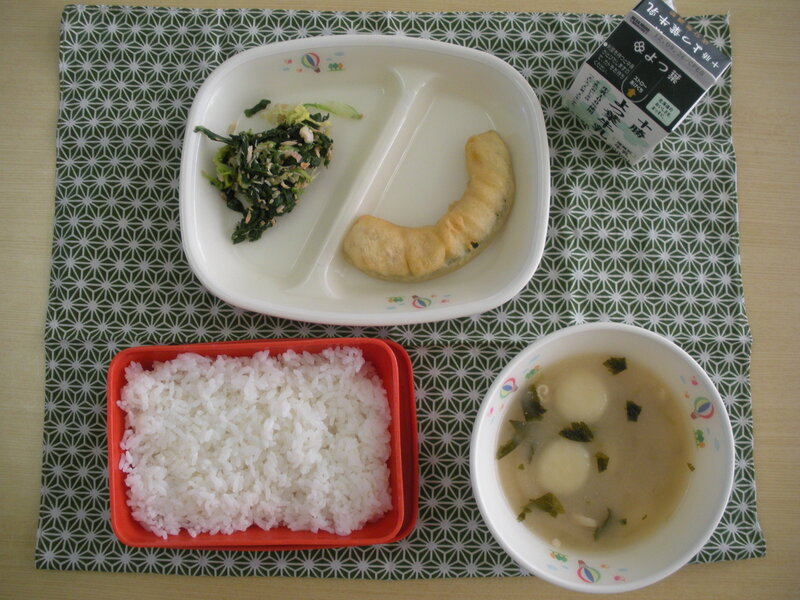 My diet at home, as I have mentioned, consists almost entirely of white rice and soymilk. While such a mild diet prevents stomach pain and makes me happy, it is somewhat lacking in vitamins. So the bibimbap–with its multitude of interesting vegetables–and miso soup–with the distinct flavour of trefoil and its soft mushrooms–were a much needed repast. School resumed on Monday, but I hadn’t any class because I had the fortune to present at a certain meeting for foreign teachers. 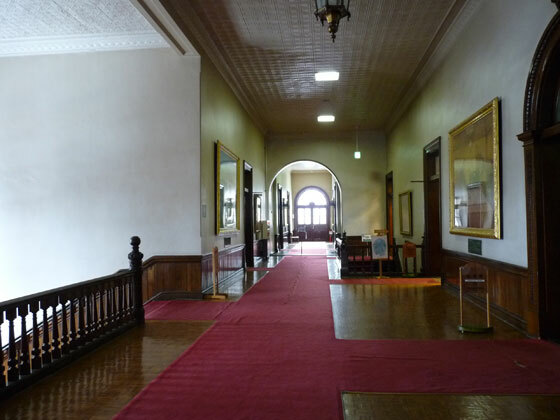 It was held at the lovely Akarenga, built the twenty-first year of Meiji and more formally called the 北海道庁旧本庁舎. The Akarenga is built, as its name implies, of red brick, and in an American new baroque fashion. Baroque has a connotation of overwhelming decadence, but that is not the feeling the Akarenga displays. She is elegant, but simple. She was built beautifully, but only for the purpose of encouraging good and pure thoughts in men endeavoring to shape the future for the better. Abiding in such a charming building, especially for such a short time, truly reminds me how sad and lifeless modern architecture is. Unrelatedly, while I generally considered myself a rather unfashionable person, I received so many compliments on my charming clothing during my stay there, I am beginning to think I ought to be more arrogant. Photographs fails to capture the subtle splendour of such a building like this. Bibimbap is a Korean dish in which Korean style namul and meat is placed on top of rice and mixed together. “Bibim” means to mix, and “bap” means rice. I can’t say I have ever eaten real Korean bibimbap. When I flew Korean Airlines to France, bibimbap was served both there and back and it was spicy to the point of being inedible. 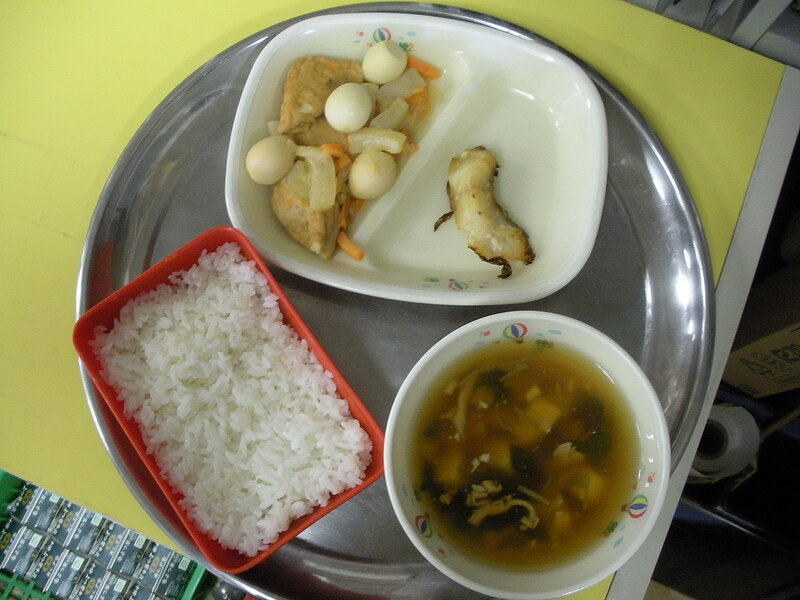 However, school lunch bibimbap is not spicy at all and I enjoy the flavour quite a lot. I doubt it tastes like korean bibimbap at all, a hypothesis underscored by the fact that one teacher whose favorite lunch is this bibimbap has no special affinity for Korean food at all. The main disadvantage to this lunch is that since I am not a fan of meat, I have to pick out the scary pork and fat bits before I eat the remaining vegetables and eggs. I set a rather poor example for the students. Furthermore, I would like to comment on the fish. I did not like fish in America. Last time I ordered fish at a restaurant (visiting the sunny state of California), I could not even finish eating it, it was so bad. But fish in Japan in invariably delightful, and today’s trout was no different. I love you, Japan. By the way, ankake soup is a soup made by thickening the broth with potato starch, in the method so commonly used in (slimy) Chinese dishes. 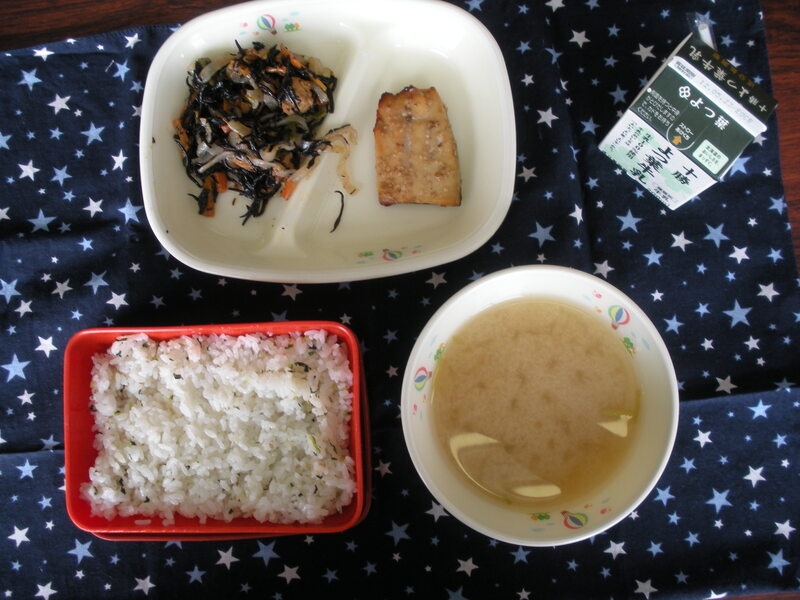 Atsuage is thickly cut tofu fried in oil. 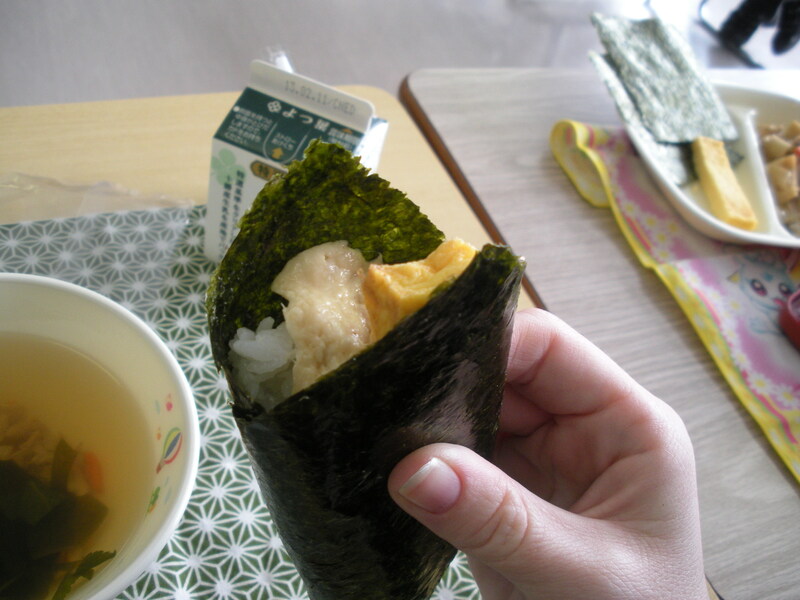 It is an ingredient that combines the virtues of tofu (lots of protein and calcium) and frying (giving body to the food). Note: Shrimp has a red element called Asutakisanchin. When alive, it’s body has a different colour that matches other things, but when boiled it becomes red.